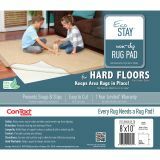 Eco-Stay Non-Slip Rug Underlay 8'X10' - VANTAGE INDUSTRIES-Eco-Stay Non-Slip Rug Underlay. Your eco-friendly rug pad solution for a greener home! Keeps area rugs in place, for use under any type of rug or mat. Protects your floors and easily cut to fit any rug, hand washable. Made from a polymer coated polyester textile. For indoor use only. This package contains one 90x114 inch non slip rug pad that fits rugs up to 8x10 feet. Imported.